Then, you'll need to select Create cluster and supply the server URL and credentials (optional). 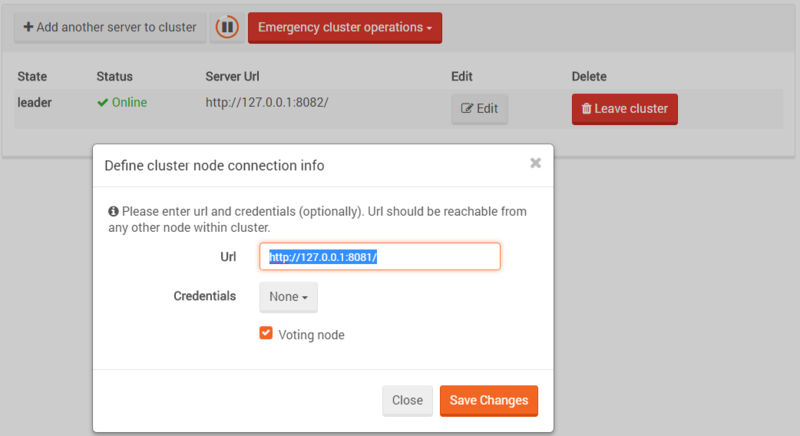 You can then add the other nodes to the cluster by pressing the Add another server to cluster button. The default leader will be the node from which the cluster was first created. In addition to the expected options like editing a node's address or leaving the cluster, we have added some Emergency cluster operations. These are operations that are not part of Raft and are provided only for out-of-the-ordinary cases and should only be used wisely (and with caution) by the admin. A node can ask to Secede from cluster, which means it will be disconnected and removed from the cluster topology. A side effect is that the node will be left with its own single-node cluster. Another option is the ability to Kidnap a node - force a node to the cluster, even if it's in another cluster. In that case, the new node will be promotable until its state is synced with the rest of the cluster. Only then it will get voting privileges. The third option is remove the cluster entirely and perform cleanup. 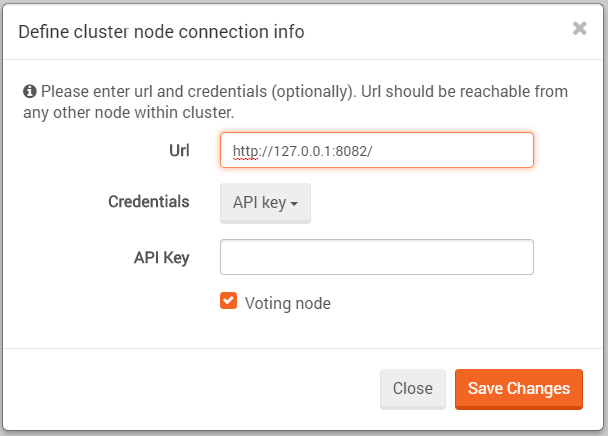 This option is needed after a node secedes from the cluster and is left with a cluster of its own. It removes the clustering information from the node, turning it into a normal non-cluster node. The fourth option is to choose a leader selection mode. You can either Require leaders to have up to date replication state or Allow leaders without up to date replication state. When the first option is set, the cluster will avoid choosing a leader whose replication state it too far out of date. See Clustering and Replication below. When the cluster is up and running, you can click on Manage your server -> Server topology -> Fetch topology and get a map of your cluster. 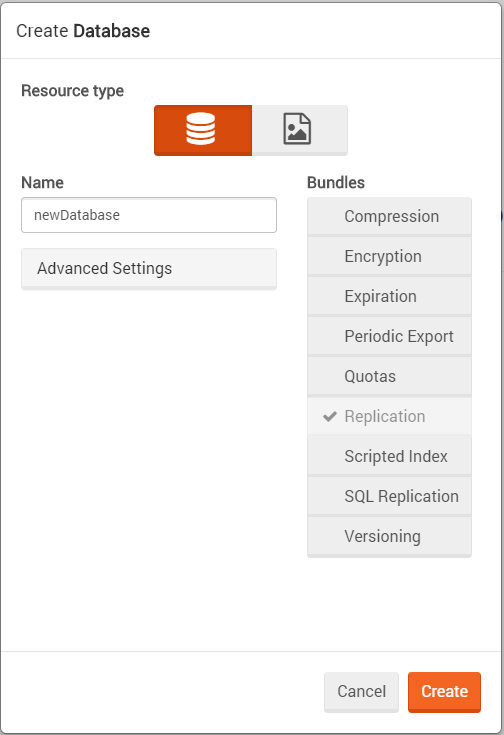 When in a cluster, every new database you will create will have the replication bundle enabled by default. This is done because in a cluster, not all operations pass through the Raft (Rachis) algorithm. Some operations like creating and deleting databases do, but document replication for example is done through the replication mechanism instead. In the cluster case - the replication topology is a full connected graph where all nodes are connected to all other nodes (clique). Failover behavior is shared with standard replication failover behavior and can be configured via the studio. This means that when a cluster is configured, the admin can choose a failover behavior in the same way as in the replication settings view but only cluster-related failover options will be displayed. Note that in the Global configuration view an admin can change replication settings for the entire cluster while in the Replication settings view, the settings will change only for a specific database. Another way to change failover behavior is by using the client API. Hot Spare nodes are allowed in a cluster configuration. If not activated, the hot spare node will not have voting privileges, thus it cannot be considered for a quorum. After activation, the hot spare node becomes promotable and can be elected as a leader. When activation expires, if the hot spare node is the leader, it will gracefully (notifying the other cluster nodes) step down. Setting replication between nodes in different clusters is not supported. You may however, define replication to a node outside the cluster, as long as it doesn't belong to a different cluster.